Convert, merge and sign your PDF documents. 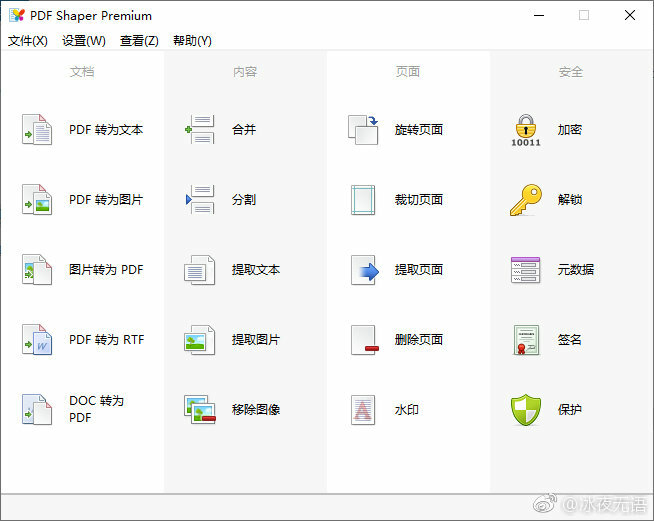 PDF Shaper is a set of feature-rich PDF tools that makes it simple to split, merge, watermark, sign, protect, optimize, convert, encrypt and decrypt your PDF documents. The software is optimized for low CPU resource usage and operates in batch mode, allowing users to process multiple PDF files while doing other work on their computers. PDF Shaper’s clean, intuitive interface allows users to become productive in just a few minutes. Available in three editions – Free, Premium and Professional. • Option to preserve text layout in text utilities. • Option to set metadata in “Image to PDF” and “Encrypt” tools. • Updated text extraction method. • Updated enumeration method for file names. • Improved CPU usage while loading and processing PDF files. – Improved support for complex table structure. – Improved support for list formatting. – Improved support for text line spacing.